This nailer is the ideal tool for framing, decking and fencing jobs. It features a strong, lightweight magnesium body, a 1-piece drive blade and rubber O-rings. The no-mar tip protects surfaces from damage, but when removed reveals teeth that grip the lumber for a secure, no-slip hold when firing. The tool-free depth adjust provides a wide variety of options for driving depth, while the air filter and anti-dust cap help keep the interior of your tool clean and functioning smoothly. The 1/4 in. Industrial NPT swivel fitting rotates 360 degrees for maximum accessibility in tight spots. Hang your nailer up with the integrated rafter hook when you need to free up an extra hand. You can quickly switch from bump to single fire using the select fire trigger. It features an anti-dry fire mechanism that protects the internal parts by stopping any firing when there are only a few nails. Insert an additional strip of nails through the rear-load magazine, and you are ready to go. This nailer is designed to use any brand of 20- to 22-degree plastic collated round head framing nails between 2 and 3-1/2 in. L (0.113 in. to 0.131 in. shank). The 21-degree Full Head Framing Nailer (model EFR2190) is suitable for any professional or do-it-yourselfer, and is high-performing in both indoor and outdoor applications. Tbook.com crawls the web to find the best prices and availability on Estwing and related Tools and Hardware products like Estwing Pneumatic 21 degrees Full Head Framing Nailer with Padded Bag. For this page, related items include products we find that match the following keywords: "Estwing" at our vendor partner Home Depot. 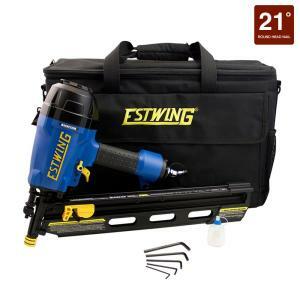 Estwing Pneumatic 21 degrees Full Head Framing Nailer with Padded Bag is one of 156 Estwing and related products listed in the Tools and Hardware section of Tbook.com If you have any questions on this product, please give us a call at 734-971-1210 during the hours of 9am - 5pm EST for assistance. Thank you for shopping at Tbook.com, the Internet Department Store!